A rich and creamy formula that delivers a gentle cleanse. Enriched with Oat Milk and Honey to calm redness and soothe irritation as it cleanses make-up and impurities from the skin. Rinse or tissue off formula. Dermatologically tested. Clinically tested safe on sensitive skin. Alcohol, fragrance, colour and gluten free. A unique toning formulation enriched with Oat Milk and Honey to soothe and calm the skin as it gently purifies. Removes the last traces of cleanser and prepares the delicate complexion for moisturising. Dermatologically tested. Clinically tested safe on sensitive skin. Alcohol, fragrance, colour and gluten free. A nourishing crème enriched with Oat Milk and Honey to calm redness and irritation whilst delivering the moisture and comfort delicate skin needs to look and feel beautiful. Apply daily after cleansing. Dermatologically tested. Clinically tested safe on sensitive skin. Alcohol, fragrance, colour and gluten free. 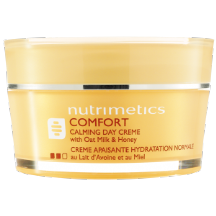 A rich crème formulated with Oat Milk and Honey to intensively nourish and soothe delicate skin while you sleep. Doubles as a day crème for dry and very dry skin types. Apply nightly after cleansing. Dermatologically tested. Clinically tested safe on sensitive skin. Alcohol, fragrance, colour and gluten free. An innovation for delicate skin. This unique eye treatment intensively hydrates the eye area whilst Oat Milk and Honey calm redness and soothe irritation. Ideal for sensitive eyes. Ophthamologically tested. Clinically tested safe on sensitive skin. Alcohol, fragrance, colour and gluten free.